Contour 30 step it up a notch from the 20. Of course, it still treads the same path – one of honesty, transparency, and sheer entertainment, but it puts it all in a bigger package. We’ve endowed Contour 30 with two 18cm MSP drivers, as well as doubling up the rear ports. What makes our drivers so special? Variable thickness across the diaphragm, for one thing. And aluminium voice-coils, for another. We can make them extremely light – but also bigger than the old-style copper units you’ll find elsewhere. Lighter weight means larger diameters, which means we can use more windings, which means we have more control over the cone movement. And that translate to more control over the sound reproduction – especially at high frequencies and high volumes. 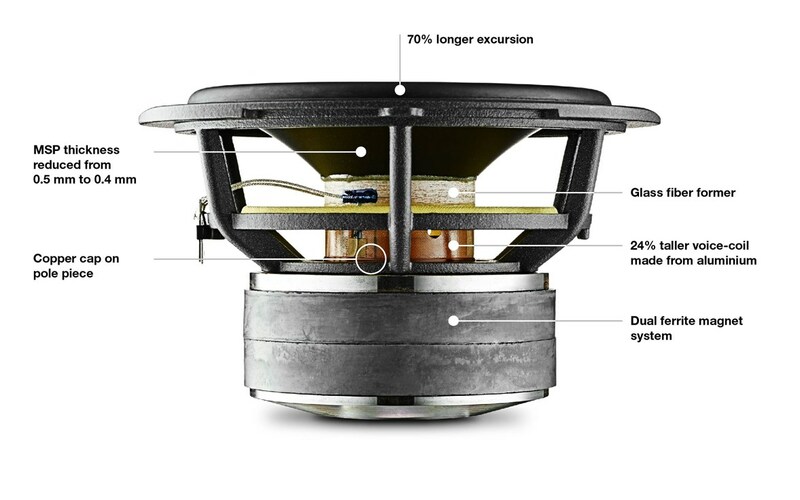 We also included the ultra-pure, ultra-clear Esotar2 fabric soft-dome tweeter. And because we’re irrepressible tinkerers, we’ve given the inside a makeover, too. As with the Contour 20 and the Contour 60, the Contour 30 has new baskets to hold the drivers themselves, as well as a new crossover and new wiring. We listened to our old Contours for months and decided we wanted the crossover to serve up even better bass. So, now you can go louder and lower.